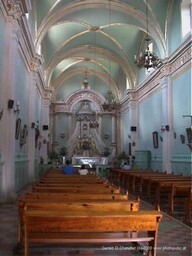 We see too many Mexican churches to keep them separate in our minds, but the main impression they leave is that the interiors of Mexican churches are much more highly decorated than the French catholic and English anglican churches that we are used to. Architecturally, churches in Mexico run the gamut from mission to baroque with Spanish colonial and neo-gothic and even one or two modernistic churches in newer neighborhoods. 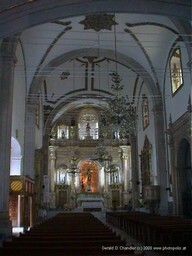 Our focus of course is principally the old Mission churches and the cathedrals of Mexico's larger cities. 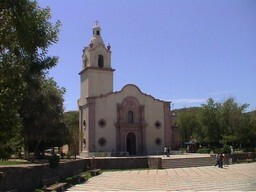 The typical mission church is whitewashed, spanish colonial sometimes with decorated front door facades and with one or two towers. 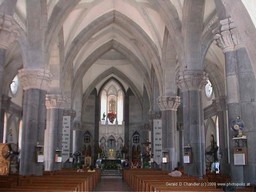 They tend to have only one aisle and truncated transepts but with a small dome above the center of the cross rather than a spire and a semi-curcular altar area sometimes with Greek revival half columns and pediments behind the altar to support statues of Christ on the cross, the Virgin Mary, and/or other saints and angels. In more elaborate city churches, the ribs of support columns and capitals are frequently gilded, and the ribs that support the vaulted ceilings are also usually highly decorated. 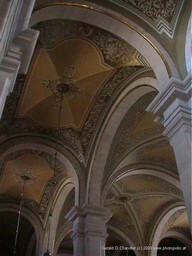 The ceiling vaults are often made of brick or stone and not plastered so that you can see the material. 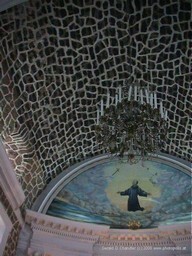 Vaulted brick ceilings like this are also sometimes seen in smaller buildings in Mexico. Perhaps it is a Spanish architectural style. Mission church walls are mostly painted a single color and may also be decorated with paintings, but in baroque churches the walls are painted in a more elaborate fashion closer to the styles we saw in Krakow, in Poland, although the colors are not as dark and rich. 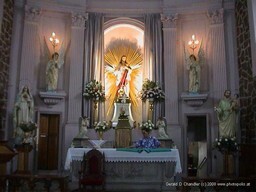 Many churches have a painted backdrop to the altar. The scene is almost always of romantic forests or mountains with a statue of Christ stratyegically placed in the center. We have never seen such things anywhere but Mexico. The richer churches also sometimes have very nice stained glass windows depicting biblical and/or national themes, such as the life of pre-Columbian Mexico and the arrival of the Spanish conquistadores. 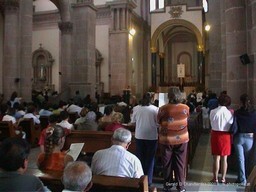 What is common to all Mexican churches it seems is very large congregations. We have attended many, many services and almost all of them have been standing room only. Like in Ukraine, the devotees sometimes indulge in practices that smack of self-flagellation. They don't go as far as the Shia muslims on the anniversary of the death of the Immam Hussein, but you will often see them on their knees walking down the aisle of the church to the altar. But there is also a very joyous aspect to the Catholic faith in Mexico, which for us was best represented by the Romeria of the Virgen de Zapopan, a three-day festival at the climax of which the statue of the Virgin is transported from one church to another with much rejoicing and merry-making.